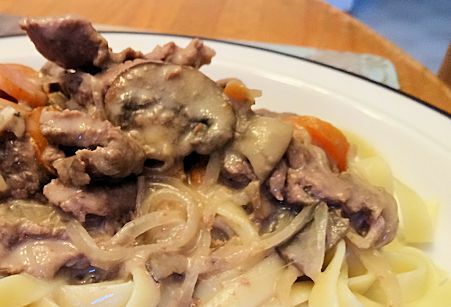 An excellent blog, Noshing With the Nolands posted a recipe for Slow Cooker Stroganoff. I love stroganoff and I am lazy so I like slow cooker. I tried the recipe (with a few changes) and liked it. So here is my version. I started by cutting the recipe in half. There is only She Who Must Be Obeyed and I. Cutting it in half makes using a can of beef broth awkward. I hate using 1/2 cans. So, I substituted water and beef base (Oxo, Bovril, etc). I also substituted some sherry for part of the wine. I like a bit of sherry in my stroganoff. It makes me feel refined and tastes good. Also, I am a traditionalist when it comes to stroganoff. I served mine on broad noodles. The Nolands served theirs on mashed potatoes. Mix flour, salt, pepper and dry mustard together. Put flour and mixture and beef into a plastic bag and shake to coat. 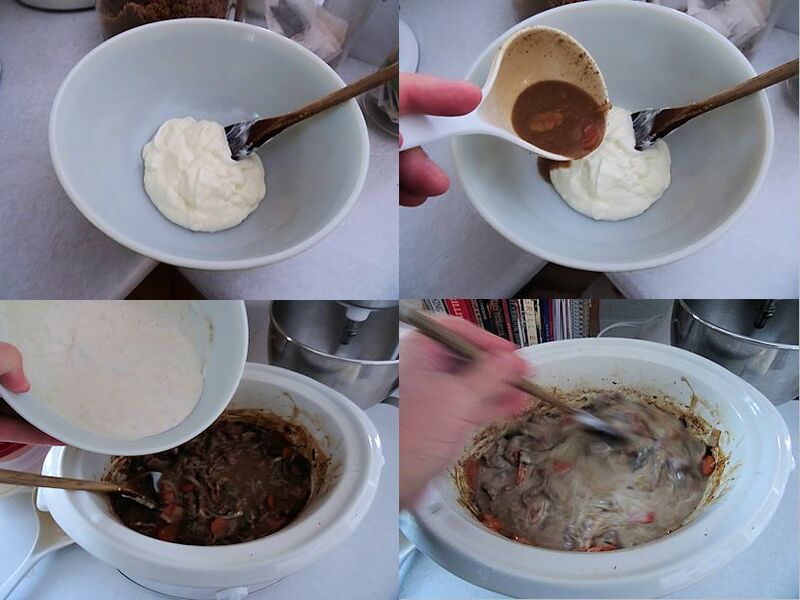 Put the beef in a slow cooker that has been sprayed with baking spray. Mix the onions, carrots, mushrooms, water, beef base, white wine and cooking sherry into the beef. Slowly mix 1/2 cup of the liquid into the sour cream and then add that to the pot and stir. Turn heat to high for 15 minutes. Serve over cooked broad noodles. I started by cutting the beef and measuring the rest of the ingredients. Can you say mise en place? I knew you could. I mixed the flour, salt, pepper and mustard. I shook the beef and flour in a plastic bag and put it in a crockpot sprayed with baking spray. I mixed in the rest of the ingredients, except the sour cream. I covered and cooked on low for 8 hours. I slowly mixed 1/2 cup of the liquid into the sour cream. This helps prevent the sour cream from curdling. I mixed that back into the crock pot and turned the heat to high for 15 minutes. I served the stroganoff over broad noodles. This is a very good stroganoff, real comfort food. Making it the slow cooker makes it so convenient! I will be making it again. Thanks again to Noshing With the Nolands. Thank you so much for making our recipe, I love that you put your own spin onto it. I agree that the egg noodles are more traditional and I am glad you made it how you like it. Cheers, Tara. Thanks so much for the great recipe, Tara. Thanks, Sam. I am a pasta lover!